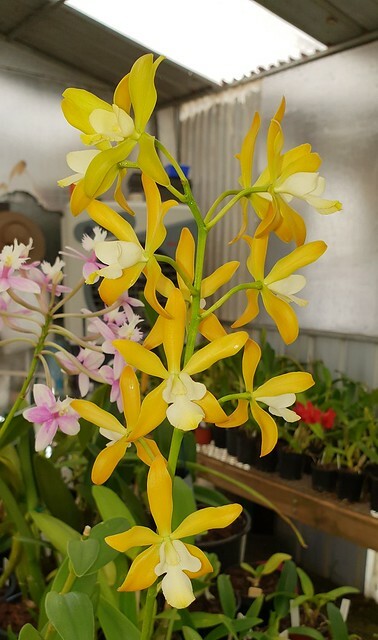 Enanthleya Burderkin Surprise 'Burdekin' - Orchid Board - Most Complete Orchid Forum on the web ! Missed posting this for some reason. Too nice not to post I think. Flowers open a rich emerald green then turn to this colour as they mature. Quite pretty I think. Is this a large grower? Any fragrance? I love the mature color on that. Very bright. And the flower shape in general is right down my alley. It's a lovely hybrid for sure. Not a large grower, as a comparison, compact Cattleya size. Light scent only.